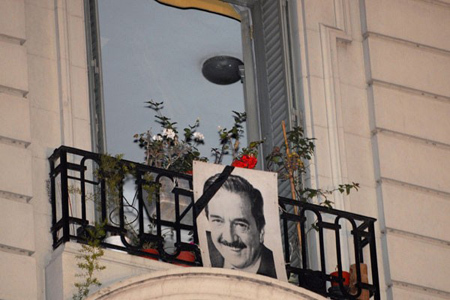 After several years of fighting lung cancer, former President Raúl Alfonsín passed away this evening at 20:30 in his home on Avenida Santa Fe in Buenos Aires. The news came as no surprise since Alfonsín’s health had taken a turn for the worse a few days earlier, but the response from both the public & the media was no less sentimental for it. Born in 1929 in the Province of Buenos Aires, Alfonsín used his law degree as a stepping stone to politics & affiliated with the UCR (Unión Cívica Radical)—the same party born of the 1890 Revolution. Risking his life to investigate cases of desaparecidos during the last military dictatorship, he later won the 1983 election for President… the year democracy was restored in Argentina. Alfonsín’s term reflected the turbulent times & the need for conflict resolution. He inherited an abused economy with extraordinary debt & hyperinflation but managed to make some improvements with the equivalent of a National Food Bank Plan (Plan Alimentaria Nacional). However Alfonsín’s greatest contribution to Argentine society was taking the prior military regime to Supreme Court & trying them for human rights abuses. Further economic problems forced him to resign seven months early to his successor, Carlos Menem, in 1989. Regardless of the ups & downs of Alfonsín’s presidency, he is remembered as a studious politician who valued democratic process… a man who did not hold a grudge, strived for consensus, & never abused his position of power. 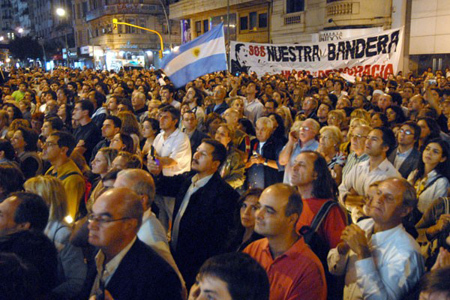 That’s something remarkable in Argentine politics & mainly why his death caused such a massive response from the public. About 500 people went to his house & held a candlelight vigil while either chanting his name or singing the national anthem. Three days of official mourning were called for by Vice-President Julio Cobos, in charge of the country while Christina Kirchner is in Qatar on her way to London for the G-20 summit. The family agreed to have a public wake for Alfonsín in Congress the next day, & he would be buried the day after in the pantheon for the fallen during the 1890 Revolution in Recoleta Cemetery. 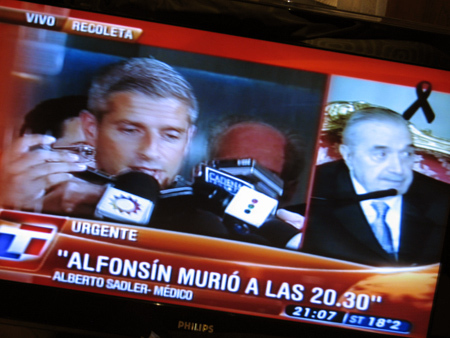 Alfonsín will be the first President buried there since Arturo Illia (term 1963-66)… also a member of the UCR political party & buried in the same pantheon. All photos except the first are from the DyN news agency.